Woodcase pencils rarely get more legendary than the Blackwing 602. Despite having developed a cult following for how well the pencil performed, the Blackwing brand was finally discontinued by Faber-Castel in 1998 after a specialized machine used in its manufacture was broken (more on that later). Fast forward to 2010, where the Blackwing brand was resurrected by the Cal Cedar Pencil Company. 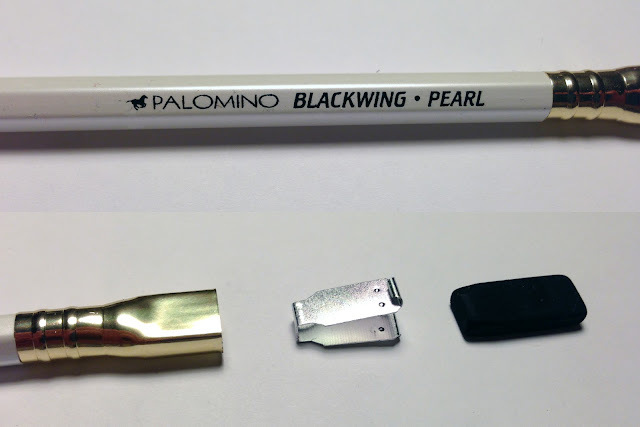 Many comparisons were made between the original Blackwing 602 and the newly released Palomino Blackwing 602. Some complained the newly-spawned reincarnation wasn't good enough, while others were glad to have options without resorting to insane Ebay prices for the originals. Regardless of how one feels about it, the Blackwing 602 is back and, presumably, here to stay. After the re-release of the Blackwing 602, two other versions of the pencil were introduced under the Blackwing brand. One of those versions is the Blackwing Pearl, and thanks to Brad over at Pen Addict, I have been lucky enough to have an example to play with. Enough about the history, let's get down to the nitty gritty. Let's start by talking about the most obvious features of the pencil, the eraser. Ironically, the most distinct design element of the entire Blackwing line was also the cause of its original demise. From what I understand, the originally manufacturer of the Blackwing 602, Eberhard Faber was purchased by Faber-Castel in the mid 90's. Production of the 602 required a specialized machine to manufacture the unique ferrules and that machine was now broken. Faber-Castel didn't wish to repair or replace the specialized machine because they felt the market for the Blackwing 602 wasn't strong enough to justify spending the capital to repair/replace the machinery. Fortunately, there were enough parts already on hand to continue making the 602 until 1998, when it was officially discontinued. Lovers of the Blackwing 602 began to hoard any existing examples and it wasn't unheard of for single pencils to sell for over $20 on sites like Ebay. When Cal Cedar stepped up and purchased the trademark for the Blackwing, they also tooled up to make the iconic ferrule assembly a reality once again. It must have been a great expense to do so, as they could have reintroduced the Blackwing line with a regular ferrule and eraser and saved on manufacturing costs. But, I would guess, someone at Cal Cedar "gets it" and knows that a faithful recreation will endure over a rebranding of a classic. Remember Crystal Pepsi? So at this point, we now have three options for the Blackwing brand and I am going to talk specifially about the Blackwing Pearl. The Blackwing Pearl is described on the Pencils.com website as featuring "...a pearl white finish, black imprint and eraser, and a balanced and smooth graphite core that is softer than the graphite found in the Palomino Blackwing 602, but firmer than the graphite found in the Palomino Blackwing." Now, only being familiar with the Blackwing 602 until this point, I was unsure what to think about this new addition to the Blackwing brand. The Blackwing 602 is designed to hold a point for a long time and to provide a smooth writing experience, while the Blackwing (no 602, just Blackwing) is designed for artists and musicians with a softer lead. The Blackwing Pearl is supposed to fall in between these other two versions, but I found myself questioning why? The other two versions of the Blackwing have very targeted user groups mentioned in the descriptions of the pencils, but the Pearl does not. So why even bother? I have a theory. I was looking the Pencils.com website and noticed that they are introducing other non-pencil items under the Blackwing umbrella. These include luxury journals, sketchbooks, and folios. Because the Pearl is mostly differentiated by it's pearl white finish, and not by its graphitic (is that even a word?) performance, I would bet the push is to establish a "luxury" version of the blackwing to appeal to those not interested in the matte black or grey colorways of the Blackwing and Blackwing 602, but wish to still be in the Blackwing owners club. Or, they just want a way to visually separate the three versions of the pencil. Arguments could be made on both sides, I am sure. 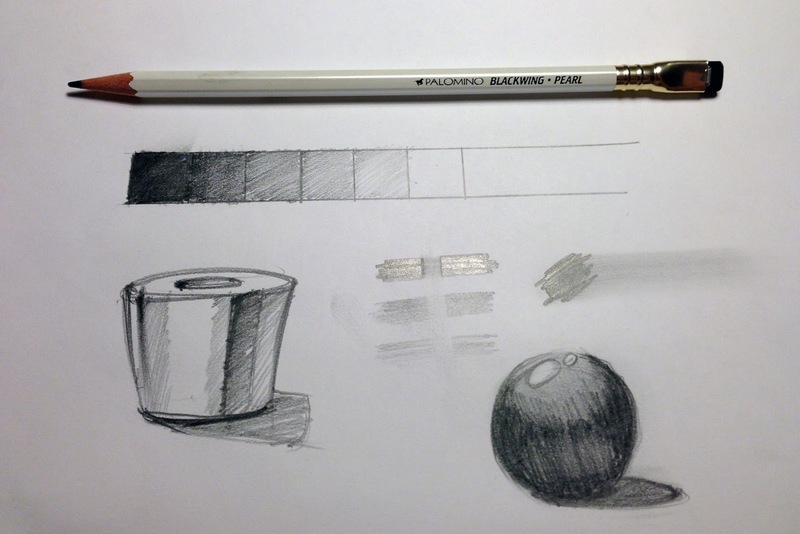 As compelled by my artistic background, I did a quick sketch test to evaluate the graphite in the Pearl. I found that the pencil took a nice point very easily and didn't seem to dull down very quickly. This was nice. The cedar in the pencil is very aromatic when sharpened and brings back instant nostalgia when inhaled. Although not apparent in the above photo, the lead isn't really that dark. I attempted to get a very saturated black, but the lead didn't want to cooperate. While it went down on the paper very smooth, it wouldn't cover completely, even after several passes. Controlling the density in a gradation was difficult, like with a very hard composition of graphite, all the while being very, smudgy. You can usually take a soft graphite and blend it out with your finger for midtone coverage, but the lead in the Pearl almost seemed waxy and didn't want to work that way. It erases very easily, even with the supplied eraser. I wasn't impressed with the eraser, but they apparently make several versions and colors (black, white, pink, green, blue, and orange!) that tend to work better, so that isn't so much an issue. But, don't expect to make really dark, heavy marks and expect the stock black eraser to last very long. Normal writing and line-making gets erased just fine, with no extraordinary effort. So, in summary, the Blackwing pearl is stuck in between it's two siblings, not quite an artist, but not quite a writer. Don't misunderstand my criticisms, the Pearl is a very capable pencil. The fit and finish of it's manufacturing is perfect. Everything looks as it should and it performs just as well as any other premium woodcase pencil. I just don't know quite what to do with it as I don't feel I fit into it's targeted audience, whatever that may be. I do know, that I now really would like to try out one (or both) of the other models in the Blackwing line. Because, if they look and feel, and perform as they say, I should be very satisfied. Color me curious. PS-(A great deal of information about the Blackwing brand can be found in a Wikipedia article here).